After 36 blissful weeks of pregnancy (ha...ha...) I made my final trip to labor and delivery triage on February 1st. I had been counting my contractions. Timing them as they became increasingly annoying. I made a Target run to get birthday presents and Valentine's Day goodies "just in case". I debated on whether I wanted to spend my Saturday evening in an uncomfortable hospital bed and a drafty gown (again). Finally, at the urging of my mom and my husband we decided I better go get checked out. We did the normal one hour on the monitor. It confirmed that yes, I was indeed contracting. But this time they were painful. Like an 8 or 9 on a scale of 1-10. With each one I cried and squeezed the life from Ricky's fingers. They checked my cervix and...no change from my doctor's appointment 2 days prior. I burst into tears. I silently pleaded with God to have mercy on me and make-this-baby-come-out-NOW or I just might stop believing he exists. I begged the nurse for pain meds, assuring her I was NOT being a wimp. I reminded her I had done this THREE TIMES BEFORE and this was the most pain I'd felt with any pregnancy. She paged the doctor to get his approval and when he agreed to dope me up, I wanted to do a happy dance. If I wasn't going to have this baby that night, I was at least going to get some relief from the pain before I was sent home with my tail between my legs. A few minutes later I had a particularly strong contraction which prompted the nurse to check me "just one last time". She said she wanted to make sure I hadn't changed before giving me the pain meds as once I got them, I would most likely not be able to get an epidural if I did in fact go into labor quickly. I knew there was little chance I made any progress in the two minutes it took for her to get the medicine ready, but I sure hoped. Lo and behold, a panicked look streaked across her face. She stepped back and said (in more graphic words than I want to post here) that I was "ready to have this baby". And, like, NOW. I screamed out "OH THANK YOU GOD!" but quickly realized that the panic on her face had to mean something. That something was made clear when her next words were "I'm not sure you'll even have time for an epidural." The doctor was called and given the update. He was at home, y'all, and so I truly thought I was gonna have this baby WITH NO PAIN MEDS and with some random on-call doctor rather than one of the physicians I had come to know. For me, that is when panic set in. I was shaking uncontrollably (nerves, adrenaline, FEAR FOR MY LIFE!!!) They whooshed me out of triage to a delivery room where everything was being done full steam ahead. All the while I prayed fiercely: "Okay, God, you heard my prayers before. So please hear them again. Please let me have time to get the horrifically large needle in my back before this baby makes his debut. I know I'm being picky here, but I'm begging you." While nurses shuffled around at a feverish pace, my mom and sister made it to the hospital. A sigh of relief. I was checked once again and I hadn't changed much. Another sigh of relief. The doctor got there. I was feeling much less anxious now. And finally, the lovely lady with the needle came waltzing through the door. I damn near jumped out of bed and hugged her. Twenty minutes after getting the epidural, Nolan Alexander entered this world. Although it may not have gone as smooth as I'd have liked my last labor and delivery experience to be, it was the most amazing thing ever. What a gift I was given. And...for those of you wondering...this really is our last baby. No, really, it is. I'm serious this time. 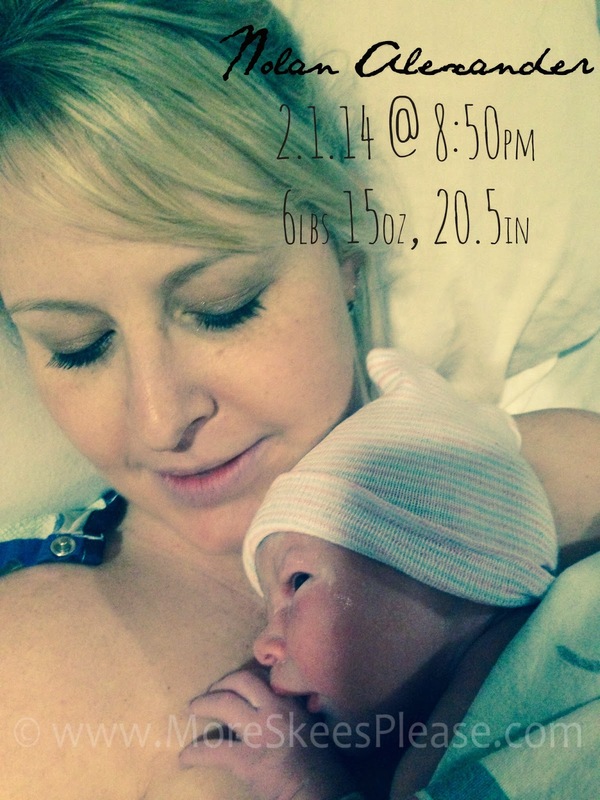 This is a beautiful birth story, sweet friend. . . I felt so anxious for you a time or three!! I found mine yesterday when i went to my parent's house to get my toys, dolls and barbies for my daughter to play with. Thought i would share that!